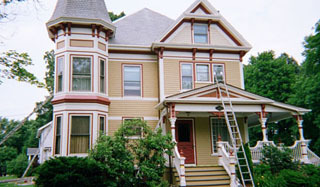 Services Offered by SCH Painting - House Painting Professionals - Exterior Specialitsts in Traditional Victorian & Unique Design - call 781.279.1444 for your free estimate or fill out our on-line form - Home Painters in Melrose Massachusetts, Stoneham Mass, Reading Ma, Wakefield Mass, Malden Ma, Everett MA, Lynnfield Mass. Serving the communities of Greater Boston and the North Shore. The first step in the home exterior painting process involves the SCH Team meticulously preparing the environment that surrounds the house; thoughtfully and cautiously securing and covering any landscaping, yardage or anything that would have the chance of being disturbed. We have hundreds of drop clothes and if needed industrial strength Hepa Vac with all the proper hoses and filters. Then we start to thoroughly remove and carefully scrape off any loose paint and other substances using only the best tools and materials including carbide scrapers. As a follow up to scraping the team will painstakingly and completely go over each and every section of what will be painted; where ever needed we'll carefully remove paint with 80 grid sandpaper and multiple styles of electric power-sanders. Our methodology and procedures will enable the surface that would be painted to be in optimal condition prior to applying any cleaners, primer or paint. Next to using only the highest quality paint, the exterior preparation is certainly the most important factor to produce an amazing finished product. Power washing sometimes referred to as pressure washing is a step in the process that is not always recommended or shouldn't been done in certain weather or with delicate surfaces. If the material we're painting on permits, this is a step that can help remove dirt, dust, old chalk or even mildew. On occasion we'll come across a home that it is not proper to power-wash and in those instances we'll hand wash, use blowers and/or use cleaning solutions to help prepare the house best before we address applying the primer. Between scraping, sanding and washing it's imperative we completely clean the surface prior so that exterior paints and other base coatings have the proper surface to adhere. As a general contractor SCH painting is indeed a one-stop solution for all your exterior home and repair needs and construction. It's so much more convenient and beneficial for the homeowner to have someone skilled in repair and restoration to trust and rely upon to properly paint and restore your home to optimum condition. 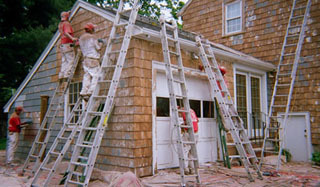 Often times we'll come across issues with rotten wood, bad trim, splits in the shingles or clapboard, concerns with fascia boards, the need for wood or seamless gutter repair, shutter installation or repair and door repair or replacement. 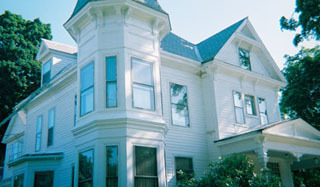 We specialize in Victorian design and restoration and hard to find victorian molding and trim. The next vital step in the process involves coating the external sections of the home with our carefully selected oil-base primer. After years of trying different primer options we've handpicked a premium solution that helps create the best surface for paint to adhere. After our rigorous and meticulous cleaning of the home there is bound to be bare spots of wood. Each and every area of the exterior will get a full coat of primer as it's essential in assuring the highest quality in the finished product. It's key in the last part of preparation and when done properly can add years to the life of the exterior paint. Once prepared we conclude the process with two generous coats of premium paint. The paint you choose is extremely important; we have our recommended brands and selections and will give you plenty of advice but we are more then willing to use any preference you may have. 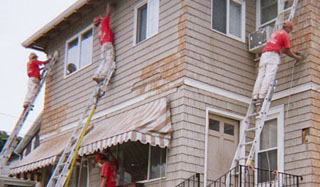 After being involved with painting homes for more then thirty years there are many proprietary methods we've developed including a technique in which we add special additives and what we call our special sauce to guarantee a superb finish and extend the life of the exterior paint by years. Victorian design and historical home renovations have been something we've specialized in and have dedicated our careers. Pressure Washing is one of the most affordable, quickest and easiest ways to improve your home or condos appearance, and value. Preventing the buildup of dirt, mold, grime mildew or any other debris from getting into the little nooks and crevices within any surface should be a homeowners or building managers concern. 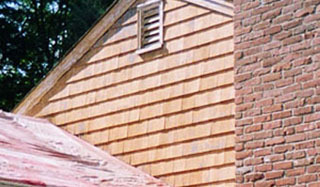 Restore the finish of almost any surface back to the original color and finish. Restore curb appeal and increase your property value. 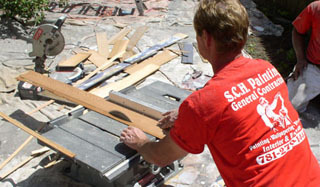 Contact us today for your quick and free estimate.